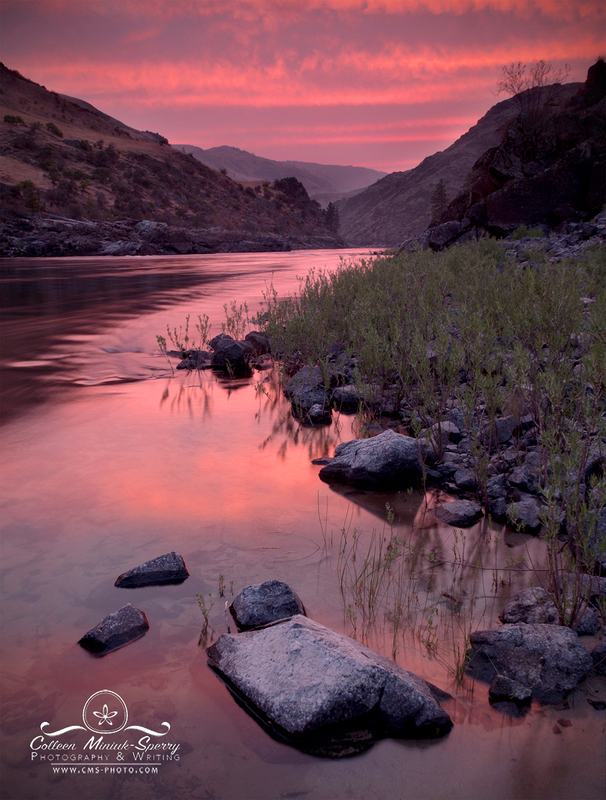 PHOTO CAPTION: “In the Pink,” from our Day 2 camp on the Lower Salmon River, ID while on the recent OARS “SUP Experience” river trip || Prints available! Click on photo to order yours. “Do you see the line?” asked Liam, our guide and stand-up paddleboard (SUP) instructor. Liam and I, along with my friend, Scott, stood on the basalt boulders high above Snowhole—the Lower Salmon River’s only class IV rapid—surveying the scene. The sun poked through ominous clouds tinted yellow by the smoke of distant wildfires. The steep jagged cliffs of Snowhole Canyon constricted one of the last undammed, free-flowing rivers remaining in the United States into a fury of agitated water tumbling over and around house-sized rocks before disappearing around the bend. We couldn’t portage (carry our boards overland) around the rapid. We had to go through it. I stared into the froth looking for a path. PHOTO CAPTION: At our put-in, Pine Bar. The stand-up paddleboards we borrowed are on the far right and behind the boats. 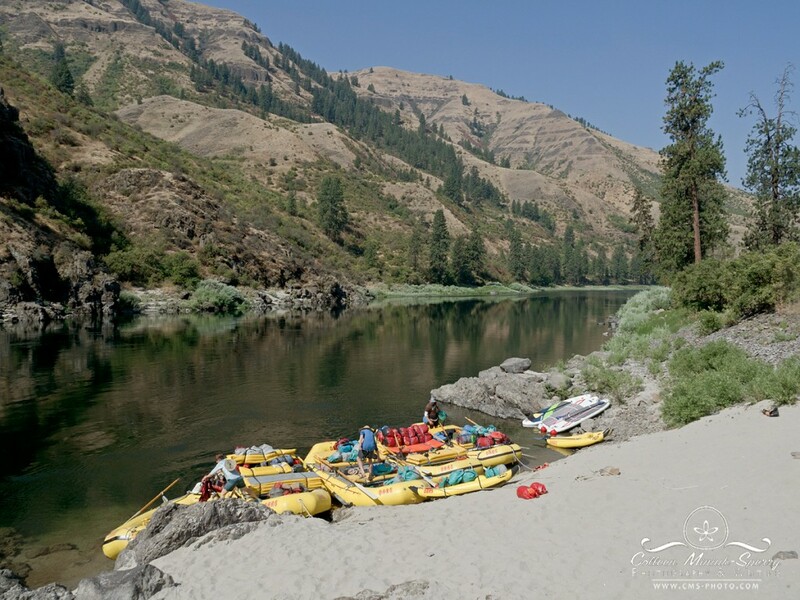 We were two days into a four-day “SUP Experience” with OARS, a company specializing in river rafting trips, where Scott and I were learning how to SUP through whitewater rapids on a 61-mile trip (from Pine Bar on the Lower Salmon River to Heller Bar on the Snake River). Since falling in love with paddleboarding in 2013, my previous SUP experience included exclusively flatwater, rivers and lakes. Except when feisty winds kicked up. (Lake Powell, I’m looking at you.) And that one time in April 2015 when I thought I was going for a nonchalant outing with a guide on the Colorado River in Moab, UT, to celebrate my 40th birthday and ended up running three class I-II rapids (and falling the last one). But all in all, I’d been on a board enough times to stop counting how many days. This was Scott’s 10th day on a board. I had entered the first big drop on Half-and-Half standing up, but fell in the water when the third wave in dumped me sideways. I managed to get back on my SUP and started paddling again from my knees, but the river’s current pushed me toward a big hole the guides had suggested we try to avoid. I panicked. When I rocked up the crest of the towering wave, it bullied the nose of my board backward. The hole sucked me in. I stopped paddling for some reason. I met the river face first. Underwater, my board hit my helmet. At least I know which way is up, I thought. My arms flailed. I couldn’t find the surface. When I did, I gasped for air, then the current dragged me under again before I could finish inhaling. I could hear Liam yelling, “Grab your board!” I couldn’t find it among the darkness and bubbles. I resurfaced. “Grab my board!” I could see his board but couldn’t reach it. I went under again. “Swim hard left!” Liam said. I spun my left arm while trying to keep myself afloat with my paddle clutched in my right hand. Eddy out at that beach just ahead, I thought. Swim harder! Come on, swim harder! “Swim hard right!” he said. Swim hard right? But the beach is only five or six feet away, I thought. I should trust him. He could see the big picture. I couldn’t. I switched the paddle into my left hand and swam hard right. The graveled shore disappeared. The current pushed me downstream toward a chiseled basalt wall to the left. “Turn your feet downriver!” Liam said. I rolled over like an otter and smashed into a wave. And into another and another. A rugged rock jutted out of the cliff in front of me. I could get trapped here, I thought. I kicked as hard as I could against the boulder and spun backward into an eddy. Liam stood on top of his board in the flatwater at the end of the wave train, bumping his fist on top of his helmet. At the start of the trip, the guides told us if we did not return this signal, they would assume we had broken a femur, or worse. I pulled my hand out of the water and bumped the top of my helmet. Scott pushed my board, which he had rescued mid-rapid, in front of me. I mounted my SUP and coughed uncontrollably. I had made it down Half-and-Half, and I had learned my lesson. Don’t ever enter a rapid timidly. And don’t ever stop paddling. Now, at river mile 23.4, I pointed at Snowhole, tentatively tracing the air with my finger. “I think I see the line,” I said to Liam and Scott. As we scouted the river’s drop, three private rafts ran Snowhole. Each took a slightly different line—left of the tongue, right of the tongue, and straight down the middle. Each tipped precariously onto its side when approaching the pyramid-shaped rock, then recovered, and disappeared over the long drop, then reappeared, and bucked wildly through the splashy wave train. Each somehow stayed upright. “You’ll go for a swim. But it’s way shorter than Half-and-Half,” Liam smiled. He said “when” not “if.” Semantics are important to writers just as clients surviving is important to guides. “When do I need to decide?” I asked. “Let’s grab lunch first,” Liam said. While we ate chicken curry salad wraps, we watched several more rafts stay upright through a short harrowing run. I visualized the run over and over. Start right, paddle hard left, but not too hard, then keep paddling. Seemed simple enough. Ladybugs clung to my white shirt. A good omen, I thought. Maybe I could do this. After all, I didn’t come here to sit on a boat. I came here to learn how to paddleboard rapids. Another half-hour passed. No one asked me again whether I intended to run the rapid on my paddleboard. And I’m not sure I ever came to a formal decision. Even a final look with Maia, the trip leader, wasn’t convincing. When lunch concluded, everyone in the group returned to their respective vessels. I got back on my board. “You ready?” Liam asked while bending his knees on his SUP. I didn’t respond. It didn’t matter if I was ready or not, this was happening. I gave myself a short pep talk. You got this. It’s just water. Hit the line perfectly. Keep paddling. Liam disappeared into the waves. I dropped to my knees. The silky smooth tongue pulled me into a curled wave. Paddle. Then another, a bigger one. Paddle. Then another over my head. Paddle. Paddle. Rock on the right. Paddle, paddle, paddle! Hole on the left. Paddlepaddlepaddlepaddlepaddle! I plunged over a ledge and came face-to-face with the biggest wave I’ve ever seen on a SUP. I stabbed my paddle into it, jabbing at it as if I were slaying a mythical beast with a sword. I kept swinging, wave after wave, until the rapid fizzled out. I had spent almost an hour paralyzed by fear, and in about 30 seconds, it was over. I don’t know if I hit the line perfectly or not, but I had just stayed on top of my paddleboard through Snowhole. Liam was right. I was totally stoked. 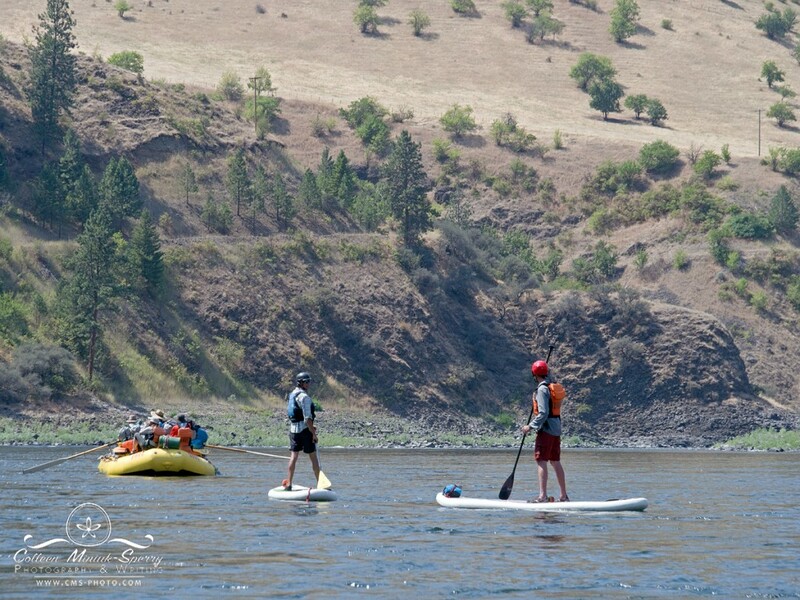 When I read the line, “Learn the basics of stand-up paddleboarding, reading whitewater, & river safety” in the OARS description on their website prior to our trip, I never imagined we would face a class IV rapid, let alone run it on a SUP. In doing so, though, I learned that when a river—whether “The River of No Return” (as early explorers called the Salmon) or the river of life—drops you to your knees, don’t ever enter a rapid tentatively. And don’t ever stop paddling. Authors Note: My GoPro died after being submerged in Half-in-Half with me so I sadly have no footage of our run through Snowhole. Should you wish to see an example of what the rapid looks like, though, these two Youtube videos (taken by by people not on our trip) will give you a pretty good idea of the conditions: https://youtu.be/2-e8kakcf94 and https://youtu.be/tS1piA2yvTc. 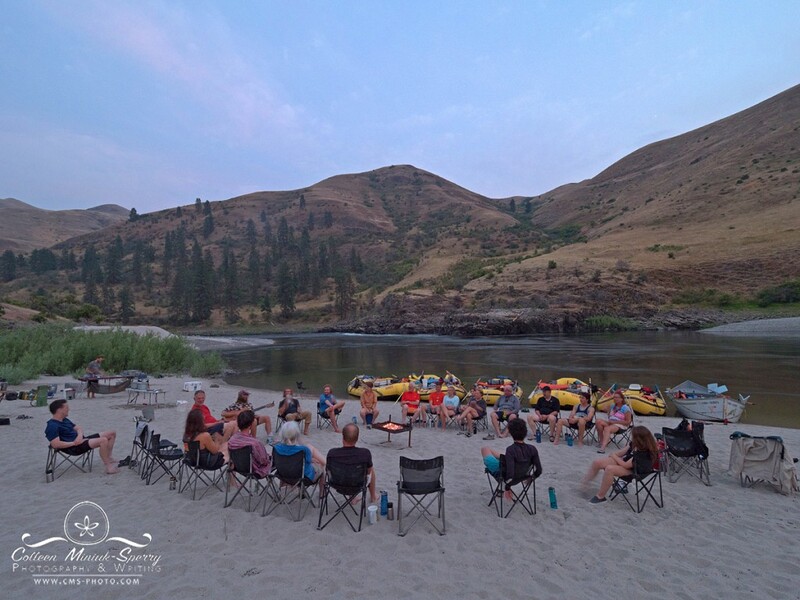 PHOTO CAPTION: One of our guides, Sean, serenades us in camp after sunset on Day 2 of our river trip with OARS on the Lower Salmon River, ID. Great job Colleen. I’m proud of you. You are AMAZING! And a fabulous writer! Thanks for the ride. Thanks Kathe! I appreciate your kind words!